✎"Excellent, once again! Can't wait to use these to reinforce the concept. There's something magical about Valentine's day. Thank you for sharing! :)"
✎"Thank you! As an upper grade classroom, it is nice to have support activities that will engage students who still need to review at their individual levels as other students move on." ✎"This is a great sampler pack. 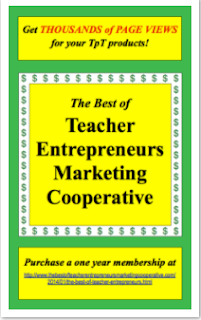 There are a variety topics that are appropriate at the 3rd grade level. The layout is very good and easy to follow. Thank you." 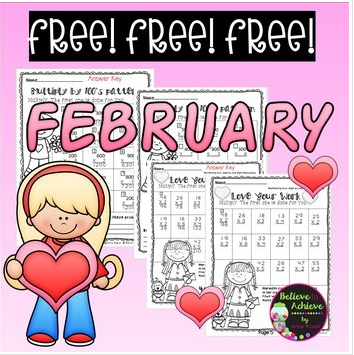 ✎"This is a great sampler and will be perfect for February. I'm excited to check out the rest of the packet. Thank you!" 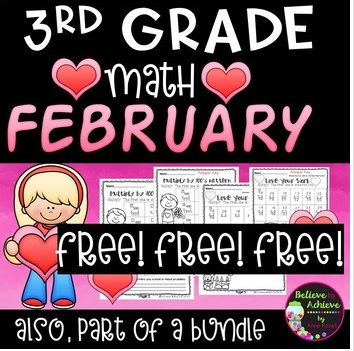 The COMPLETE set has 30 pages of math work plus a bonus activity which is perfect for February!